Pump Street Bakery are welcoming applications to join the team at their small, family-run bakery and café. This is an opportunity to learn more about real bread and to work in an exciting, dynamic and award-winning independent business. - One vacancy on the café team - this vacancy is for a cook or chef (at CdeP or Sous level) to work 4-5 days per week - job share opportunities considered. - One vacancy for Head of Pastry (full time). A keen interest in food and hospitality is essential. All team members must truly enjoy working with food, interacting with customers and be ready and enthusiastic to learn about the bread and the food they serve. Their warm, welcoming team are great to work with and supportive. Encouraging people to take on opportunities to learn in other areas of the business e.g. bread, pastry, chocolate. Perks include two consecutive days of per week at most times, no evening work, and bread and pastries to eat! Successful candidates will have a proven record of being hardworking and responsible in previous jobs. Relevant experience is imperative. Ability to work under pressure is essential. A highly innovative and exciting new fermented foods startup lauching in May is seeking an enthusiastic, motivated and responsible foodie to run a kombucha brewery. Combining the work of Kombucha brewer Louise Avery (Lois & The Living Teas), William Kendall (Cawston Press, Green & Blacks, Covent Garden Soup) and Mark Palmer (Marketing director of Pret A Manger, Cawston Press, Green & Black’s), the new company is launching a national brand to offer kombucha to a wider audience across the UK. This is a great opportunity for someone who has experience in food production, and is ready to run their own facility. The ideal candidate will have some basic knowledge of kombucha and fermentation, although full training will be given. They will be willing to lead the production side of the business, eventually running their own team as the business expands. It is essential that this person be willing to take on multiple roles at the initially small brewery. The successful candidate should be passionate about experimentation and fermentation, while still maintaining stringent quality control standards. This highly motivated, enthusiastic production manager will work alongside Louise Avery, to upscale the current process, set up the new manufacturing plant and then take over the operations side once it is up and running smoothly. Full training on kombucha will be provided, however any additional brewing experience in a microbrewery would be highly advantageous. A joyful celebration of all things totally delicious (and totally Suffolk), this is the foodie's festival. 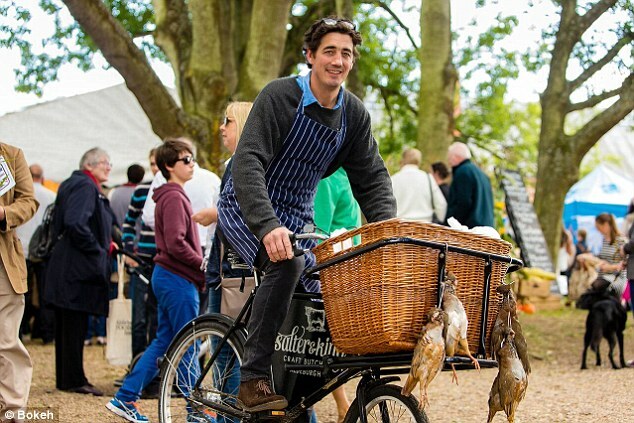 Over 90 Suffolk producers gather to flaunt their tasty wares, host workshops and take part in discussions alongside well-known chefs. The 2016 programme is still being curated, but last year's included Jose Pizarro, Thomasina 'Wahaca' Miers, Dhruv Baker (winner of MasterChef 2010) and Rosie Birkett. We are so please to have Diana Henry, award winning food writer attending this years festival and bring along copies of her latest book, A Bird in the Hand. Join Diana at the festival for flavours of the unexpected lunch Sunday 27th September, 12,30pm. Kicked off with a glass of prosecco and an interview and Q&A session, followed by lunch. This lunch will include a menu taken form Diana's books and cooked for you by local chef Peter Harrison. Tickets available on the day from the information tent. To celebrate our 10th anniversary we have been working with local videographer Rory Fitzgerald to produce a series of behind the scenes producer videos. We thought it would be nice to take a closer look at our producers and see why they're so special. Good Sense Research, part of leading food consultancy firm Food Innovation Solutions, is a consumer research agency that works predominantly in the food and drink industry. This September we are teaming up with local enterprise agency, Menta (also based in Bury St Edmunds) to co-sponsor the festival’s start-up marquee, a great working partnership that will benefit the up-and-coming food producers in the area. Amongst the Aldeburgh Food Festival’s aims are; encouraging people to support the local economy and reduce our carbon foot print by buying local, encouraging people to grow and cook their own food, and promoting the abundance and variety of food and drink produced in Suffolk. Embedded in the very essence of the festival are some of today’s fastest growing consumer and food trends. The Ugly Vegetable Movement is gaining momentum as companies seek to promote the purchase and consumption of ugly or less-than-perfect fruit. In 2014 France’s 3rd largest retailer Intermarché took their inglorious fruits campaign viral and served soups and shakes in the supermarkets made from ugly veg, in a bid to demonstrate that they are perfectly fit for consumption. Here in the UK Waitrose has its range of ‘weather-blemished’ fruit and earlier this year Asda trialled its wonky fruit and veg campaign ‘Beautiful on the Inside’. ‘Dumpster dining’ is also a means to raising awareness about food waste. Skipchen in Bristol is a non-for-profit café that has been serving up nutritious meals made out of surplus food picked out of supermarket skips. Naturally, the menu changes daily offering variety and the customers are invited to pay as they feel. Those who are struggling financially are also welcome to eat for free. In true no-waste fashion, anything left over at the end of the Skipchen day is given away rather than put in the bin. Original Unverpakt in Berlin, Germany is a packaging and wrapping free supermarket, championing sustainability. Of course this means that certain things are unavailable, such as toothpaste in a tube, but the founders believe it makes for a better shopping experience because what’s sold in store has been selected as the best option. Transparency is another big trend. Consumers want to know exactly where their food has come from and the importance and appreciation of local, homegrown produce is increasing. An extension of this, something that is also driven by the 2014 changes to allergen labelling laws, is clearer labelling on products that tells consumers all they want to know about what the food contains. Finally we are seeing the development of alternative protein sources to feed the growing world population and in particular, entomophagy or the consumption of insects. Whilst the United Nations’ Food and Agriculture Organisation estimates that two billion of the world’s population already eat insects as part of their normal diet, we are only beginning to see this movement in the UK. Ento is a London based start-up that creates foods using edible insects. In conclusion, the Aldeburgh Food Festival is more than just a fun-family day out; it’s a celebration of Suffolk food that champions many of the solutions to broader societal issues. So when you visit the festival, have a think about the broader food and consumer trends that are present in each of the stalls and keep your eye out for the edible insect based products that will no doubt appear in the near future! The second film takes a look at The Cake Shop Woodbridge a family run bakery here in Suffolk also featuring The Tide Mill Woodbridge.